When Mega Man illustrator and co-designer Keiji Inafune left Capcom in 2010 after a 23-year stint with the goal of “starting his life over,” many suspected his influence in the gaming industry was also over. Fortunately that wasn’t the case, however, as Inafune launched a new company shortly after called Comcept. 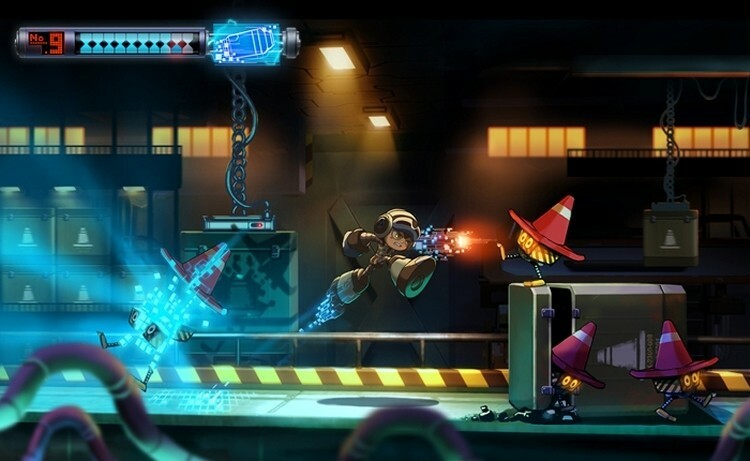 After being involved in a few small projects, Inafune chose Kickstarter as the platform to debut his first game under the new banner - Mighty No. 9. It’s described as a Japanese side-scrolling action game that takes the best aspects of the 8- and 16-bit era classics we all know and love and transforms them with modern tech, fresh mechanics and most importantly – fan input. Gamers play the role of Beck, the only robot that somehow managed to avoid infection by a mysterious computer virus that has caused all mechanical creatures in the world to go haywire. The game features six stages (more if stretch goals are realized) that can be tackled in any order using weapons and abilities stolen from enemies. In other words, it sounds and looks a heck of a lot like the Mega Man reboot that was scrapped a few years ago after just six months of development. Mighty No. 9 has already raised more than $600,000 of the $900,000 goal from more than 10,000 backers in just a couple of days. A $20 pledge is all it takes to receive a digital copy of the game once it’s ready for prime time. Estimated delivery of the title is slated for April 2015.